Hello my name is calmdev developing projects with Cryengine for over 10 years, With Assimilated Reality's, present Velocity, A planned, Arcade racing game with a difference, not only can the player race around unique enviroments, Velocity adds to the vehicles various dynamic and functional technological upgrades, and abilitys, weapons and other constructs and objects the player can utilize and use against oponents + interact with the enviroment. 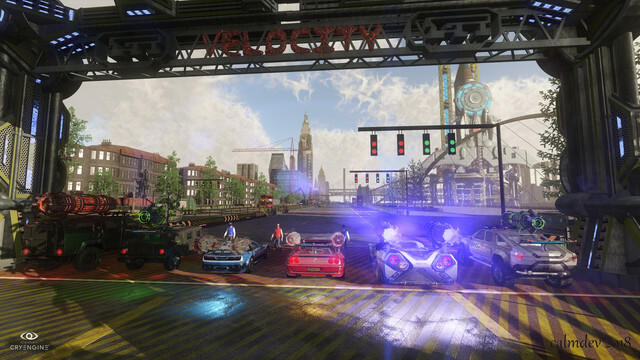 With additional gameplay modes planned such as, Stunt arena w/physics obsticals, ramps, jumps. 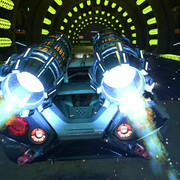 Race modes + weapon system implementations such as auto targeting, mines, All with intention enhancing the players functional ability during gameplay. 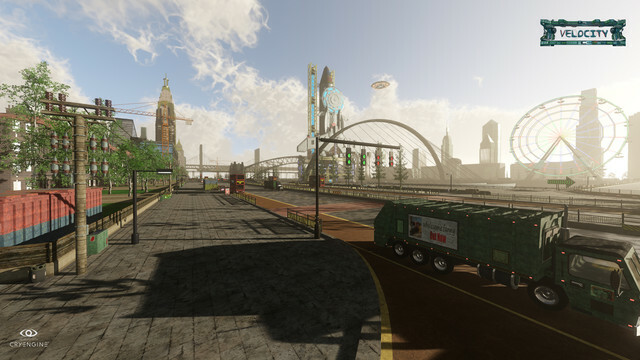 The enviroment/levels planned furthur engage the player with unique + stylized visuals, creating athmosphere's with more variety and freedom for the player. 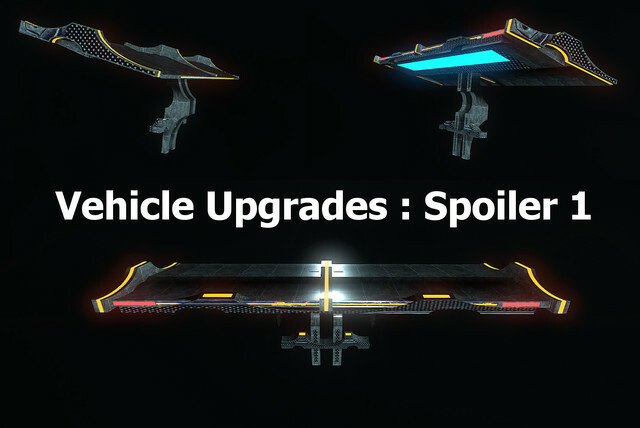 Upgrade systems : 3 seperate hyperdrives the player can choose from each having planned unique variating types of particle effects> weapon types, dynamic function. 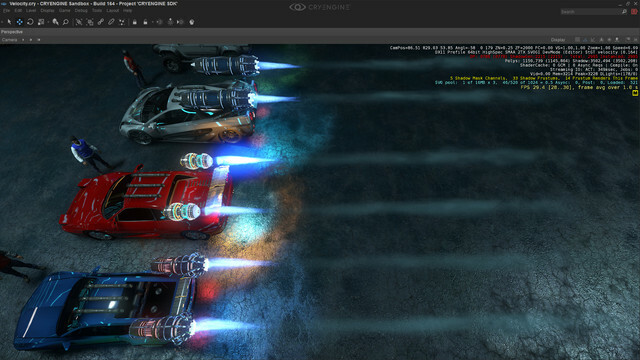 Boost system : This is are of wip to impulse using physics forces to the vehicle physics systems appropriate conditions along with the particle system, create a dynamic and physics correct, Boost system thus in corrispondence to the hyperdrives additional movement parameters applied via the Cryengine's vehicle physics to the players chosen vehicle. Up to 5 AI, efficent and, additionaly upgraded with weapon systems and enhancements, sheilds, targeting missiles, blackhole mines, and more additional systems planned. Some footage of 'hyperdrive' vehicle upgrade system designed through flow graph system for movements rotation, material emissive strength, All gives the player more functional additons, dynamics not in your average racer! Utilzing Cryengine's particle system will further enhance both visual beuty + variations in interactvity in the game world. The hope is for all this combined to emerge the player in a attractive enviroment reality, a game which is enjoyable visualy, engaging and functional. Release date/Type = When the optimal prototype is ready, expect a workable download beta at some point in there near future. Updates to follow, w/ more detailed description and outline on planned features. 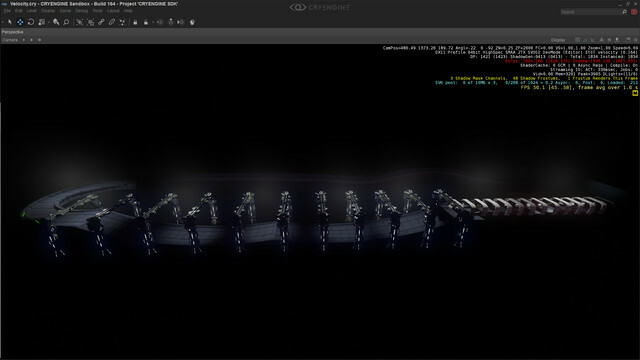 Below is more ingame [early stages progress still] Images. Last edited by calmdev on Tue Sep 25, 2018 11:05 pm, edited 8 times in total. 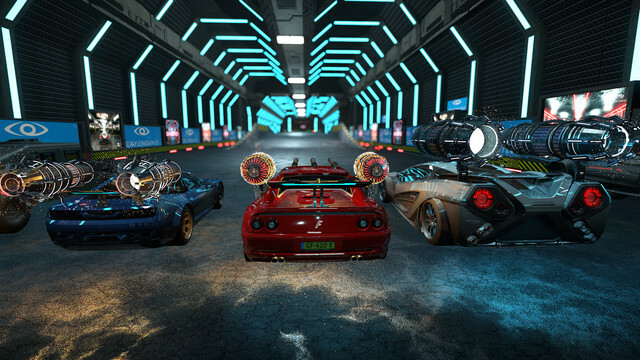 Oh yeah, it only takes a few adjustments and some ingenuity then Cryengine is ideal for a racing game project. probably more changes which i can't remeber. This video is a test for the Hyperdrive engines Audio SFX, check it out. Todo list for this month, is to model a police light for the maximus AI vehicle + change it's texture to more of a 'Police' style, then a new video showcasing all the new changes which i'm currently working on. Awesome work there calmdev. Looking forward to more of this. 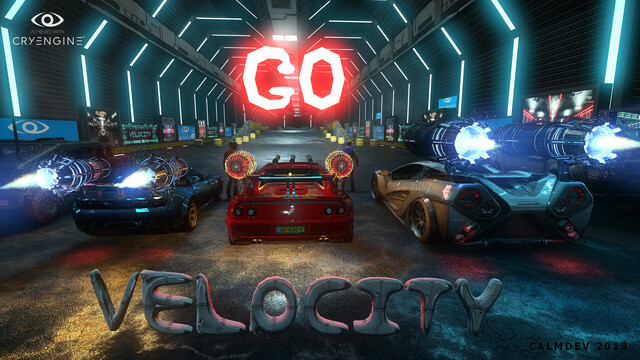 Watch the new video of Velocity Race #2, Pine City city enviroment / test preview footage i could perhaps use in sometype of story backdrop for the game. 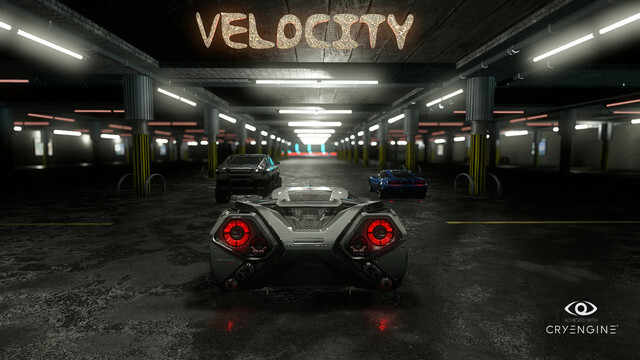 I'm releasing Velocity early demo for testing, This pack contains the new Pine City level & the Velocity Level. ^Folder, Then run this Game via the Editor Only/ Your GameSDK shortcut. 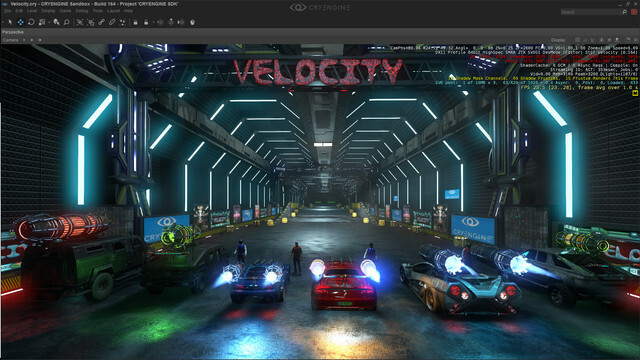 Then from the Editor window, File/Open Level PineCity Or Velocity. In the PineCity level use B to enable and disable the boost system. In the PineCity level use X to start the Race. Notes on the Boost System : The Boost kicks in 3 seconds after driving forward (W), Press (S), to Stop the boost at any time. A few Controller inputs have been assigned but since my controller is broken I've set up the flowgraph systems mainly using the keyboard, feel free to check out the flowgraphs and change any assignments to the xboxkey flowgraph nodes instead, If you want to use a Controller. This is a very early release of this game and is incomplete, many features eaither not working or in progress, use this download to study and mess around with in the Editor Only. This download contains many models which I am giving away here for free feel free to use them as you wish as long as you credit me or the creators of the vehicles, if you reupload or use any objects in this game on a video or such. Also inculded here is many nice textures you are free to use with your projects. 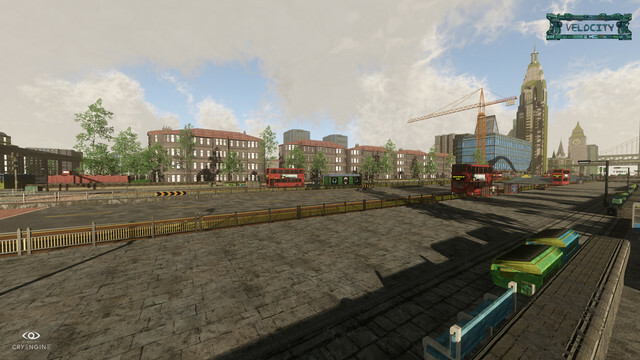 Thease levels have had much time and thought put into them and should give an idea of how the finished product/game will look/feel, as of this time this game is very early stages of development and may have many bugs for eg. The vehicle physics in the Velocity level is very buggy for some reason on the 5.5 preview, also the Boost system may have bugs. 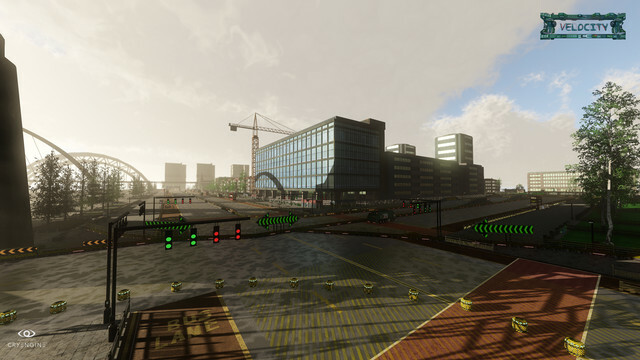 Any info/tips/ideas you may have to help improve or to let me know of somthing, don't hesitate to let me know on the Cryengine.com Velocity forum or DM me via Twitter, Links below. Due to a bug in the editor when reloading levels, please restart the editor each time you load a different level, or the editor may Crash.